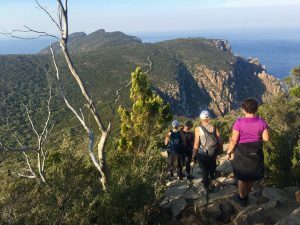 Life’s An Adventure is offering a free night’s pre-tour accommodation in Hobart on select departures for their Three Capes pack-free walk. Take advantage of this offer by booking by 31st August for any of the select dates below. Pre-tour accommodation is at the RACV Hobart Apartment Hotel, offering modern, comfortable rooms with king or twin beds. You’ll be collected from here for the start of the tour so that’s one thing less to think about! You can also take advantage of the $150 Spot Special on specific departures saving you even more! Please note: Cancellations are not available with this offer so it’s recommended clients take out travel insurance. What’s so great about Life’s An Adventure’s Three Capes Track walk? The first thing is it’s pack free so you won’t be lugging around a large rucksack – you’ll simply need a day pack for water, lunch and a jacket. Secondly the professional guides, whose job is it to make sure you have a safe and enjoyable experience. Thirdly the accommodation: two nights deluxe spa chalets at Stewarts Bay Lodge located near Port Arthur Historic Site and including excellent meals and local wines. And finally the walk itself. 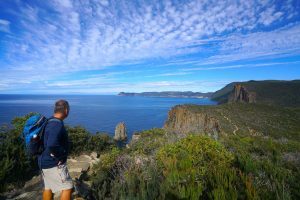 The Three Capes Track is Tasmania’s fastest growing hiking destination and Life’s An Adventure offers you the chance to experience this gorgeous part of the Tasman Peninsula without giving up any creature comforts. Highlights include the peninsula’s spectacular sea cliffs and pretty eucalypt forests. You’ll walk to Cape Raoul and Cape Hauy and for that extra ‘Wow!’ factor you’ll see Cape Pillar from the air on a helicopter or sea on a cruise! See below for select dates and for all other info visit www.lifesanadventure.com.au or phone (02) 9975 4553.